Reed Cozens – Resource Concepts, Inc. 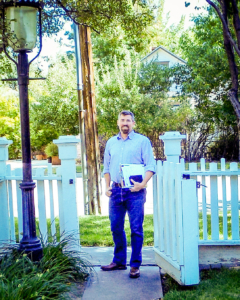 Living on the eastern edge of the Sierra Nevada Mountains in Carson City, Nevada, Reed Cozens specializes in western state water rights. His experience includes over thirteen years of ground and surface water hydrology, western state water law, water right mapping, well drilling, totalizing meter installation, and water use reporting. These skills make him uniquely informed to manage and develop a professional water right management strategy for every type of water user. He currently works as a Senior Water Rights Engineer for Resource Concepts, Inc., and looks forward to serving his community for many years to come. Reed enjoys trail running, martial arts, and volunteer emceeing for fundraising events. He loves being a husband and father and is also member of the St. Teresa Catholic School Board. Other interests include camping, home improvement, and gardening.